Our programme of events, classes and workshops support a range of ages and abilities. We welcome everyone to have a go, from the curious to the professional. Our education and outreach activity is growing so we encourage your ideas and feedback about what you’d like to have a play with. N.B. Puppet Place only offers refunds in circumstances where a course, workshop or event is cancelled. We’re conducting research for future workshops at Puppet Place and we’d love to hear your thoughts on what type of workshops you’d like to see available. The survey should only take 5 minutes, and your responses are completely anonymous. Please click the link below to access the survey. Come and join Puppet Place at Underfall Yard and learn how to make your very own puppet, with puppet maker Lizzie Johnson. In this two-hour session exploring the theme of rivers, we’ll be creating puppets based on British riverside wildlife. For children aged 4-6 years and their parents/carers, Mini Pop-Up Puppet Club is a collaborative, creative time for children and their families to explore their crafty side in a relaxed, supportive environment. PLEASE NOTE: This session has now been combined with the 1-3 pm session with the older age group. In this two-hour session exploring the theme of rivers, we’ll be creating puppets based on British riverside wildlife. 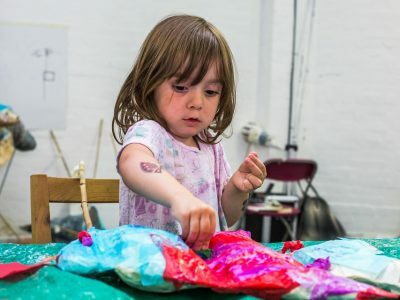 For children aged 7 to 11 years old, Pop-Up Puppet Club is a collaborative, creative time for young artists to explore their crafty side in a relaxed, supportive environment. This event is taking place at the Learning Room, Underfall Boatyard, Cumberland Road, Bristol BS1 6XG. PLEASE NOTE: We are combining our two children’s workshops into one session, so we will have children aged from 4-6 and 7-11 present in this session. A great workshop course for anyone who wants to make a puppet for the first time! No experience necessary. Learn the basics of puppet creation from design to realisation on this 6 week evening course. You will design and create a table-top puppet learning about a variety of techniques and materials. The aim, as always, is to create a puppet with expressive movement so that the character comes to life. This is a great course for anyone interested developing their puppetry making as it explores how basic principles start to become the foundation blocks for puppets with more sophisticated movement. Sessions run Wednesday evenings 6:30-8:30pm in our Fabrication Studio. Please note there will be no session 29 May. This course will be led by Lizzie Johnson, a fabricator for animation, theatre and public engagement works. Lizzie has worked with companies such as Rusty Squid, Pickled Image and RAUCOUS. For creative practitioners with some puppetry experience, this workshop is useful to anyone wishing to gain confidence or new perspectives in multi-operator table-top puppetry. The approach and experiential learning on offer is ideal for practitioners, performers and anyone leading workshops, rehearsal or research activities. 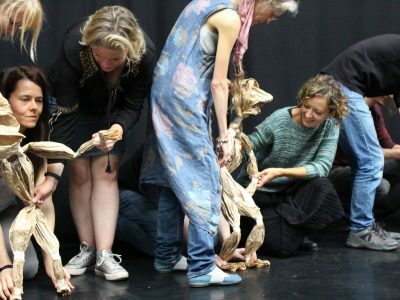 The workshop explores the fundamental principles that underpin Green Ginger’s puppetry practices and how breath-centred physicality for both puppet and puppeteer are vital to performance. All workshop materials will be provided. Chris Pirie is the Artistic Director of Green Ginger, internationally acclaimed creators of stage and screen animations. He teaches puppetry at Bath Spa University and co-produces Bristol Festival of Puppetry. 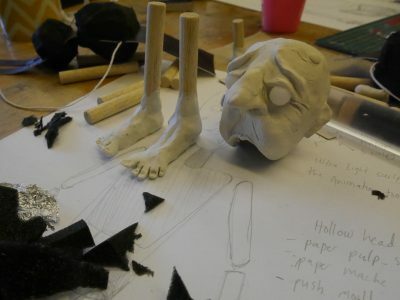 Three day course focussing on the design and build of an articulated tabletop puppet. Beginning with the performance qualities of materials used in making puppets, participants will then learn about the important relationship between the human operator and puppet in “bringing the inanimate to life”. From these first principles, participants will then and build their own puppet, learning skills of joint making and use of materials and tools along the way. On the final day (Sunday), participants will bring their own puppets to life in a performance workshops exploring range of movement and character. This course will take place in our fabrication and rehearsal studios. Please note places on this course are limited to 9 people, so early booking is advised! This course will be led by Lizzie Johnson: fabricator and designer for animation, theatre and public engagement works. Lizzie has worked with companies such as Rusty Squid, Pickled Image and RAUCOUS. The Clockwork Moth create intricate shadow shows for adults and children, inspired by the likes of Lotti Reineger and Jan Pienkowski. Their work is often performed to a live musical score. 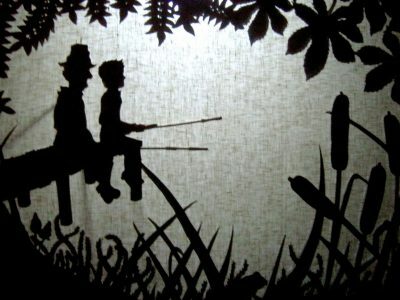 Using a working shadow-puppetry set, we will create strong, dynamic ‘scenic puppets’ from foamboard. Exploring colour, material and construction, learn to transfer your drawings into versatile, articulated puppets. Create storyboards and mimic ‘camera shots’ for a cinematic-style live-puppetry experience. This workshop will focus on practical technique with the chance to showcase our pieces at the end of the day. Richard is an eclectic maker and an accidental roboticist, with an interest in novel interactive objects and lately in things which inflate. He’s worked with Rusty Squid to make social robots, and has been known to make cutlery in fields. 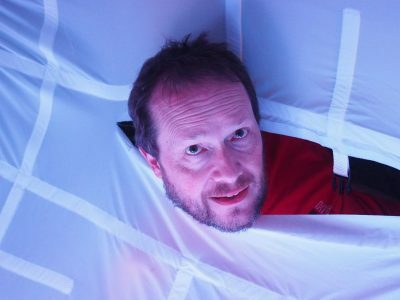 In this Creative Cafe, Richard will talk about his erratic journey through interaction and playfulness and robotics, talking about what these objects do, what people do with them, and what the point of it all might be. Weather permitting, he’ll bring one or two of them along for us all to play with. 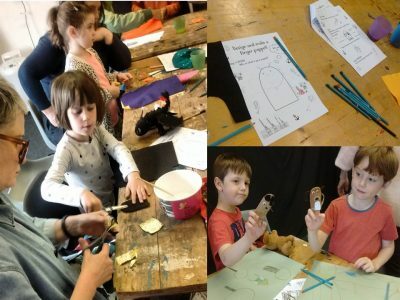 Trash-Hack is a workshop in re-purposing industrial and domestic junk to create and animate instant puppet creations, suitable for any level of experience. Be prepared to stretch your imagination, dare to fail, pull it apart and build another. Trash Hack is great for anyone wishing to gain confidence or new perspectives in accessing puppetry and making it part of their skillset. It is ideal for anyone running workshops, teaching lessons or leading rehearsal or research activities with a limited budget. Chris Pirie is the Artistic Director of Green Ginger, internationally acclaimed creators of stage and screen animations. He teaches puppetry at Bath Spa University and co-produces Bristol Festival of Puppetry. As a consultant he works with arts organisations including Aardman, Welsh National Opera, Tobacco Factory Theatres and Bristol Old Vic.